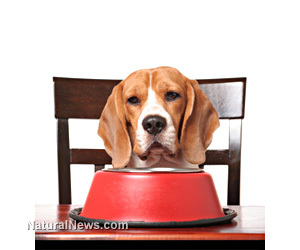 (NaturalNews) Keep your dog cool as summer sizzles its way back into season. Summer signals the time when dogs are ready for hiking, fetching, and other outdoor play. Hot summer days can be deadly to our pets unless we protect them from overheating from heat stroke. Early signs are excess panting, weakness, confusion, increased salivation, dark red gums and seizures. Keep your dog cool and prevent overheating with a variety of home remedies and common sense actions. 1. Keep your dog cool and well hydrated with fresh water at all times. Freeze a large block of ice and leave outside in the shade to keep the dog cool. If you're traveling with your dog, take water with you in a dog thermos with an attached drinking bowl. 2. If your pet becomes over heated, keep your dog cool by getting him into the shade or into an air conditioned place. Provide a raised dog house in the shade as a retreat, making sure it's well ventilated. 3. Keep your dog cool if she becomes overheated by wrapping cloths soaked in cold water around her paws, in her arm pits and on the back of her head. Run cold water so her skin is continually in contact with the cold; and place a fan in front of your dog to promote cooling evaporation, writes veterinarian Nate Baxter, DVM. 4. Trickle small amounts of cool water from a teaspoon onto the tongue of any dog that is panting or has collapsed from heat exhaustion. Small amounts of water help keep the dog cool through evaporation. Do not allow water to work its way down the throat if the dog is unconscious. Seek medical attention immediately for an unconscious dog. 5. Never leave your dog in an enclosed car during summer, even with the windows open. Dogs will overheat in just a few minutes. If the outside temperature is 80 degrees, then a car will heat to over 110 degrees in a matter of 15 minutes and could kill your dog. 6. Stake your overheated dog on a chain in the shade briefly after going for a swim to promote evaporation and cooling. Give him water and allow him to cool and dry before putting him in a crate. 7. Buy a pet bed meant to keep your dog cool. These beds are elevated and made from mesh to allow ventilation. Alternatively, provide pet beds that have cooling coils in them or places to tuck cold packs to keep your dog cool in summer. 8. Coat your dog's paw pads with Musher's Secret or similar product to protect them when walking on searing hot pavement. This is a special oil that protects paws without inhibiting sweating. 9. Apply rubber paw pads or light weight booties to protect her feet and keep your dog cool when on hot pavement or beach sand. 10. Give homeopathic remedies to help an overheated dog recover from heat stroke or heat exhaustion. · Glonoinum:Dog's gums may be pale or have a bluish cast. Weakness, vomiting. Terrible pain in head with whining and crying after exposure to sun and heat.